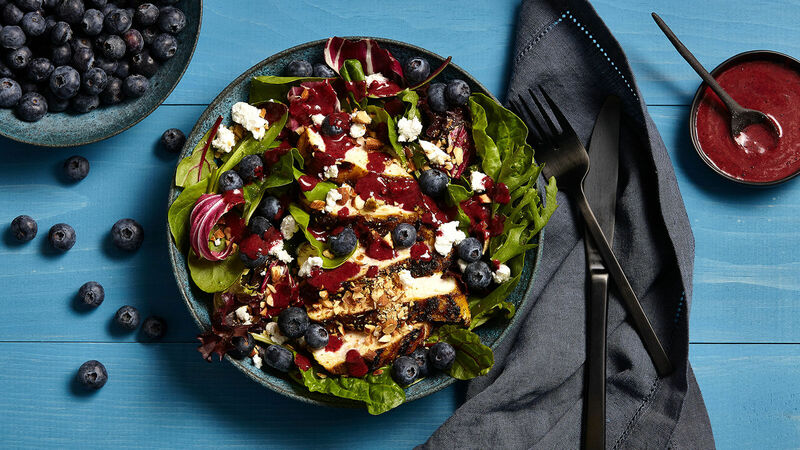 We put these blueberries in a blender to incorporate more blueberry flavor into the salad. We leave the blueberry chunks in the dressing, which makes the dressing a little coarser. But you can strain the blueberry chunks out of the dressing for a more refined salad dressing. Heat a grill or grill pan to medium-high heat. Sprinkle chicken with ¾ tsp salt and ¼ tsp pepper. Add chicken to grill rack coated with cooking spray. Grill 6-7 minutes per side or until well marked and internal temperature is 160 degrees. Remove chicken from grill and let stand 10 minutes before slicing. Combine ½ cup blueberries, oil, vinegar, honey, remaining ¼ tsp salt and remaining ¼ tsp pepper in blender or mini-food processor; blend for 1 minute or until blueberries are finely chopped and dressing is thickened. Place greens in a large bowl and drizzle with dressing. Sprinkle with remaining 1 cup blueberries, goat cheese and almonds. Top with sliced chicken.